Genetically Modified Bulls: Science Breakthrough or Horror Show? 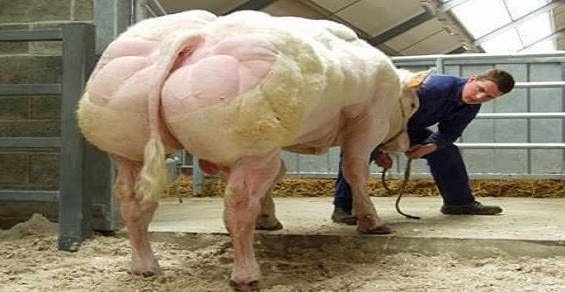 Modern science has given us another disturbing gift in the form of “selected breeding,” the process which turned this Belgian Blue bull into a hulking mass of muscle. But it's not so much GMO a story about GMO feed being used to nourish these animals; they are modifying the genetics externally to the point of mutation just to satisfy our consumer needs for “high quality” beef. So the question is: Where is the line? How much can we actually abuse these animals and still maintain our dignity and humanity? Well, the answer would seem to be that we have crossed the line by miles and miles already. We need to find a balance. Sure, the population needs food, but there are other ways than this!